This classically designed and fully functional 50 mm brass refractor telescope features wooden accents, 50 mm objective lens, a fixed 15-45x zoom eyepiece, and is an ideal decorative item for the home, office, or anywhere you may want to incorporate its vintage style. 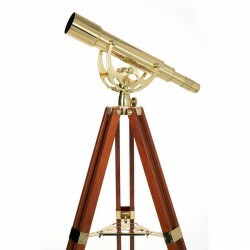 The full-height adjustable mahogany tripod includes a brass accessory tray. It’s a stylish design that is as good to look at as it is to look through. Height (tripod fully extended) 62"
Height (tripod fully lowered) 39"
Length of telescope tube 17"
Footprint of tripod (fully extended) 34 x 29"
Footprint of tripod (fully lowered) 21 x 19"